If you order whiskey neat in a bar, there is a low risk of them screwing up the drink. Plus, you know exactly how much alcohol you are getting compared to everything else that might potentially go in the glass. If I’m having a good tasting whiskey, I just want to taste the whiskey. No accompaniment needed. I have a beard sometimes and therefore it’s required of me by society to drink whiskey neat. Everyone I’ve talked to generally agrees that I look BA drinking whiskey neat. Some have even gone as far as saying I look like a BAMF, but they may be over-exuberant. Over this past winter however, I did a little dabbling in the H20 realm, and now I’ve been adding a few drops into some whiskeys depending on my mood. As a frequenter of high class bars all around the world, as I know you are, you may have picked up on this little technique and even perhaps noted that certain high class bars will serve a small dram of water alongside the whiskey. This is not a suggestion that the bartender thinks you may be alcoholic or can’t handle your liquor as I once thought in my early twenties when asked if I wanted a glass of water alongside my whiskey. The presentation of water alongside whiskey is more of a, “If you desire it…” offering. A whiskey enthusiast might state that adding a few drops of water to the glass will “activate” the aroma compounds in the whiskey. A logical and cynical mind might respond: “What the hell does that mean?” Usually, the whiskey enthusiast really has no idea, but hopefully is at least speaking from the experience they have had where they prefer the whiskey with a few drops of water opposed to the whiskey sans agua. So what’s really going on? In the simplest sense, the addition of a bit of water is masking certain aromas and enhancing others. That fact is really the actionable part of any research that’s been done so far on the subject. If you want to get really sciencey, (Which OMG, yes, do I) then you can read a nice little paper on it here. If you want an educated professional’s nicer description, you can read it here. Smell and taste both again. Do they smell or taste slightly different? Proceed to drink both glasses of whiskey. Don’t act like you weren’t going to. If you truly want to be scientific about it, I would get someone else to apply the water for you, but you’re probably drinking alone again so don’t worry to much about it. The key word in step #5 is “Different”. Notice I didn’t say “Better” or “Worse”. Just different. Different strokes for different folks. In applying this new found knowledge, whenever you come across a whiskey that you like, but it’s perhaps not “Popping” for you; give it a few drops of water. You can really keep adding drops of water until the point where you start telling yourself that “This tastes like watered-down whiskey.” If you come across a whiskey you don’t like, you are free to use it for fire-based parlor tricks, a fuel source, or a disinfectant in the event of a bar fight. Water dilution will never help a bad whiskey unless it’s diluted to the point it can no longer be tasted. Additionally, that scientific research article mentioned above which you didn’t read also concludes that cooling down the whiskey (AKA: adding ice) may have a similar, albeit through a different mechanism, effect. Personally, I haven’t found a whiskey I prefer at “Ice temperature” opposed to room temperature or slightly below room temperature, but I will leave that to personal preference. For those that really want to be an annoying snob to their friends, I would recommend only utilizing water sourced from a location near the distillery of the whiskey you are drinking. While there is certainly no proof behind it, some people do claim that utilizing the whiskey’s local water is truly the ultimate experience. I think something could be said for not using overly hard or overly soft tap water, or perhaps even the ice that has been sitting in your freezer for the past month, but here in Minneapolis, the tap water is just fine. Think of this as an extra tool in your drinking tool belt and not something that should be done every time. “Whiskey need a little sprucing? *Sprinkle in some magic water!” And remember, if you hide the water, people will think you’re drinking it neat anyway. *Extra points for creative sprinkling technique. I’m interrupting my regularly scheduled programming on wine and food to bring you this message on whiskey and whiskey. Because people ask me about that too. For those that have traveled in or around Iowa (Why? 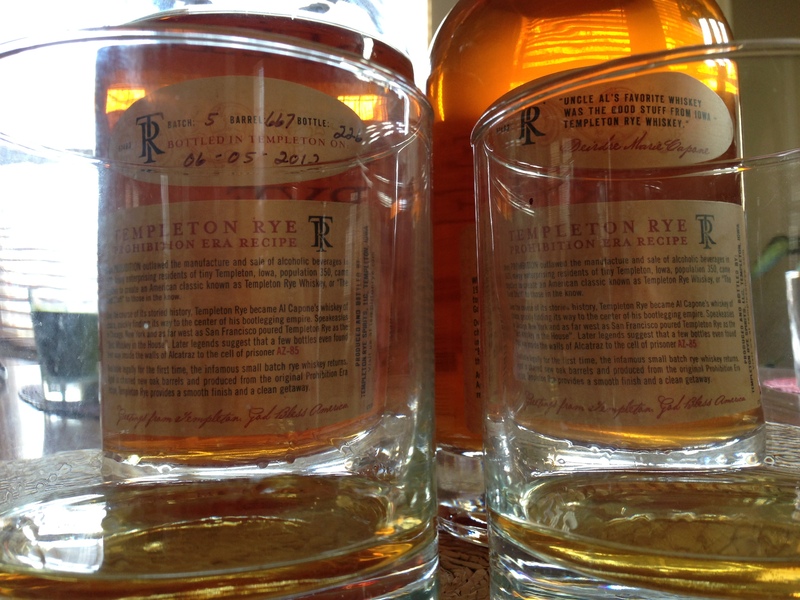 I don’t know) in the recent decade and enjoy drinking whiskey, you may have heard of Templeton Rye. 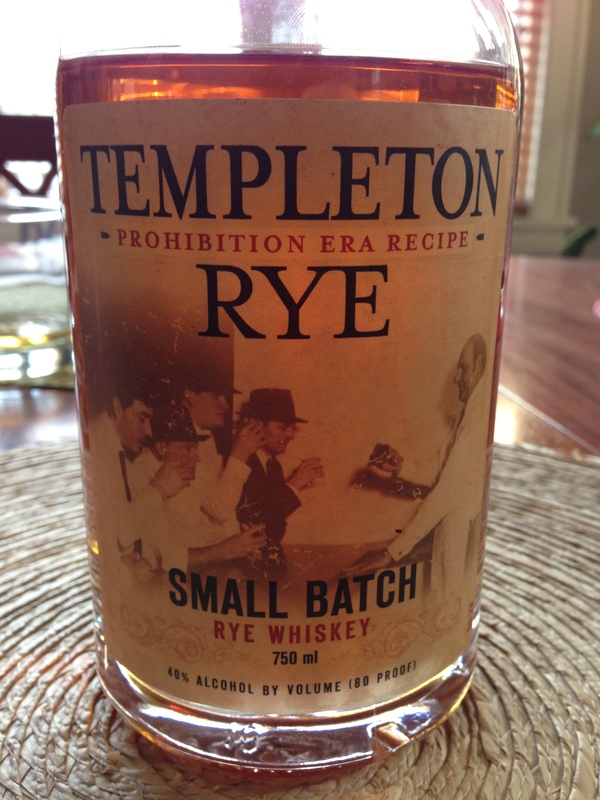 The town of Templeton, located in Central Western Iowa apparently got tired of those boring cash crops and decided to make some whiskey based on so much rye. Naturally this was back in the Prohibition days and reputedly was the favorite brown drink of Al Capone. Then again, I could be Al Capone for all the internet knows. Regardless, the common consensus is that it is a tasty rye whiskey. However, a few years ago, the folks at TR had a bit of a [good] problem on their hands. The stuff would fly off the few shelves it was stocked on in Iowa the second they were stocked. And of course, you don’t deny someone their whiskey needs. It’s un-American. Therefore, TR, a bit strapped on space, resources, and most likely general know-how on how to massively scale up their production decided to outsource it to Chicago (Most likely because Al Capone once hung out there too). Therein lies the rub for a lot of TR fans. Now, it’s pretty much everywhere. No longer is it cool to say you picked up a bottle of TR. There’s just one little catch. The distillery in Templeton is still producing* their original recipe in their original way, while the folks in Chicago are using the original recipe in some way that makes more whiskey. No need to get technical about that one since you’re probably having a glass of TR right now. Therefore, you can still be cool if you pick up one of the bottles that is actually bottled in Templeton. But those still go fast. Tell me how I’m supposed to know which bottle is which, Aaron!!!! Turn the bottle around. Handwriting means it was handcrafted. Everything else is made by hand-less workers. The question is, do they taste different? Well of course I’m going to answer that question for you. I spent nearly an hour figuring it out because I care. Obviously, it wasn’t a blind tasting, because I had no one around to pour it for me this afternoon and my pet monkey is much too lazy, but I can guarantee my professionalism during the experiment (not the monkey’s). As seen in the above picture, the glass to my left held the rye bottled in Templeton which was procured for me by a dear friend that has been wrestling other whiskey-fueled patrons to get “The Good Stuff” annually for the past few years to give to me on my birthday; the right was the outsourced bottle. The difference between the two after much considerable attention to the matter was absolutely nothing. Appearance, nose, palate; all the same. Admittedly, the Chicago bred version had just a twinge more bite to it to begin, but that was most likely because I had just uncorked the bottle whereas the other had been opened previously. The bite will mostly likely diminish slightly in the future as it is wont to do. In concluding remarks, I should impress upon you that if you are merely interested in trying TR, either option should do just fine. However, if you would like your friends to talk about how “In-the-Know” you are behind your back, go with the bottle that has the handwriting on it. I personally just like the added detail of information displaying batch/barrel/bottle/bottle date on it to make me feel better about myself, but you are free to try to fake your own back label if you want and then sell it on eBay. *A friend of mine reminded me that TR has outsourced the actual distilling from the beginning to a distiller in Lawrenceburg, IN and has merely bottled it in Iowa since it opened. If you want to see which sweet old lady from Templeton, IA hand labeled your bottle, check out the video on their website.